'Oviri', a ceramic stoneware sculpture by Paul Gauguin, probably made in France in 1894-1895, has the same title as a woodcut of the same period. 'Oviri' (the savage) is a term Gauguin used to refer to himself. On his second visit to Tahiti, Gauguin took the block for the woodcut. The print is a combination of that block and another, a composition of woman and fruit. The elements refer to the original sin - Eve picking the apple from the tree of knowledge - but with Gauguin these carry a broader association with fertility. Gauguin played a major role in the revival of the art of the woodcut. The print was once owned by a friend of Gauguin, Georges Daniel de Monfreid. 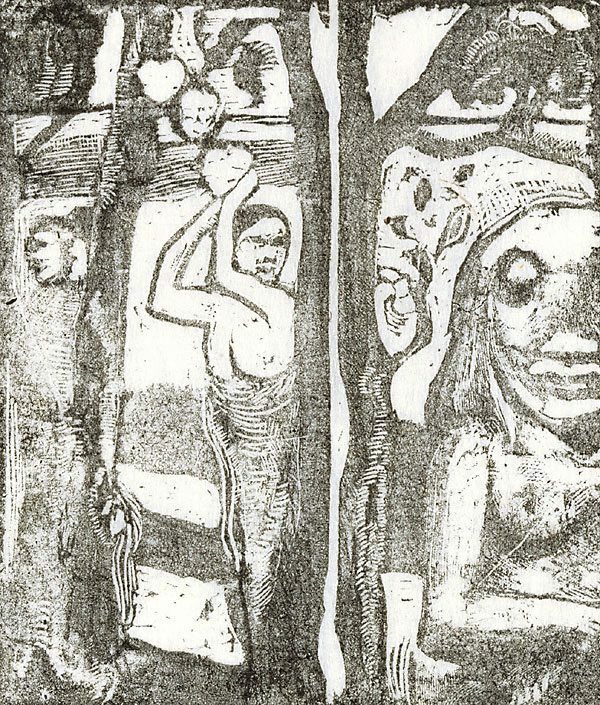 All impressions from this block are on thin 'japon' paper and were made by Gauguin himself. Guerin 49, one of six proofs known. Renée Free, AGNSW Collections , 'The Western Heritage, Renaissance to Twentieth Century', pg. 108-172, Sydney, 1994, 140 (colour illus.). Paths to abstraction 1867-1917 , Sydney, 2010, 149 (illus. ).